Providing up to 8 hours of pain relief* Anadin Joint Pain works fast and effectively to effectively reduce inflammation and fight pain. 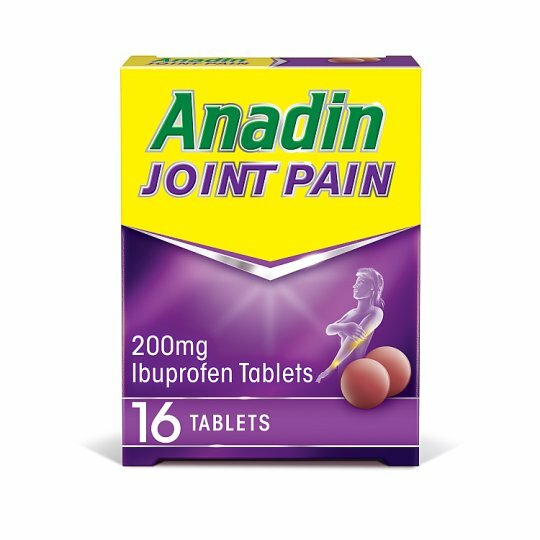 Anadin Joint Pain is an ibuprofen-based product, which targets the source of pain by blocking pain-causing chemicals where inflammation is present. For oral administration. The minimum effective dose should be used for the shortest time necessary to relieve symptoms. Take 1 or 2 tablets with a drink of water up to 3 times a day as required. The dose should not be repeated more frequently than every 4 hours. Do not take more than 6 tablets in 24 hours. 12-18 years: If symptoms worsen, or persist for more than 3 days, or you get new symptoms consult your doctor. Adults: If symptoms worsen, or persist for more than 10 days, or you get new symptoms consult your pharmacist or doctor. Do not take if you: Have ever had a stomach ulcer, perforation or bleeding Are allergic to ibuprofen (or anything else in this medicine), aspirin or other related painkillers Are taking other NSAID painkillers, or aspirin with a daily dose above 75mg Are in the last 3 months of pregnancy Speak to a pharmacist or your doctor before taking if you: Have asthma, diabetes, high cholesterol, high blood pressure, had a stroke, heart, liver, kidney or bowel problems Are a smoker Are pregnant Keep all medicines out of the sight & reach of children.